Last Matchday in the Spanish La Liga was different. Different in the sense that both Real Madrid and Barcelona lost on the same day for the first time this season. Diego Simeone's Atletico Madrid took full advantage as they closed the gap at the top of the table. Carlo Ancelotti's Real Madrid have now lost two competitive games in a row. After losing to Valencia at the Mestalla Stadium, the ten-time European champions lost 2-0 to the last year's La Liga champions, Atletico Madrid. In the midweek's Copa del Rey encounter, Atletico came out with their third victory in a row over their city rivals, following that epic Champions League final last May. Simeone rested several of his starters in the Spanish Cup's first leg, saving them for the weekend's league match against Barcelona on Sunday, January 11th. So far this season, both Atletico and Barca have accumulated the same number of points, with the Catalan club having the edge on goal difference. It would be a serious blow for the team which loses this crunch test. Real Madrid are ahead of both by a point and with a game in hand. Barcelona were fantastic in their Copa del Rey fixture on Thursday. Luis Enrique's side defeated Elche by a margin of five goals. Luis Suarez, Neymar and Lionel Messi were all on-target as the team completely dominated over their opponents. With all the rumours and news regarding the rift between the team's star player Messi and Enrique, the next few games could be interesting to see how everything develops at Camp Nou. Are the rumors of Messi being on the move in search of a new challenge really true? Valencia, who have 34 points, could come within a point to the third place if any of these teams lose on Sunday. On the other hand, Real Madrid could extend their lead at the top in case of a draw. After 17 games in La Liga, Barcelona have won twelve, drawn two and lost three. Atletico Madrid also has the same exact number of wins, draws and losses. In the last five matches, the Catalan giants have won three, drawn one and lost one in all competitions. A weird coincidence again. In the last five matches, Atleti have the same form as their competitors, having won three games in all competitions. Alike all other previous seasons, Lionel Messi is the top scorer for Barcelona after scoring 15 goals in this 2014/15 La Liga campaign. Antoine Griezmann has scored eight goals for the reigning champions and he is their top scorer in the league. 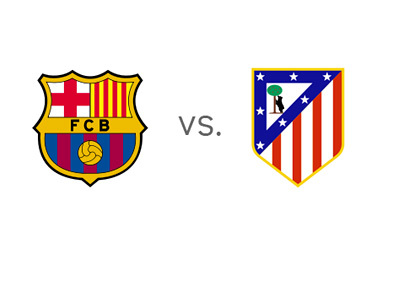 Last time Barcelona and Atletico met was in the final round of games last season. The score was 1-1, which was enough for the Madrid side to clinch their first Spanish league title since the 1995/96 season. Despite the rumored turmoil at the club, Barca are the heavy favourites to win this match in front of their home crowd. The kickoff is at 9pm local time.